This mesh backed leather desk chair from Office Star features an Air Grid screen for complete breathability and a fully padded leather seat with built-in lumbar for maximum comfort. The chair features a range of adjustment options for full customization, including tilt control with adjustable tension, pneumatic one touch seat height, and adjustable arms. Combined with the mesh back, these features combine to create a chair designed for maximum comfort and style. 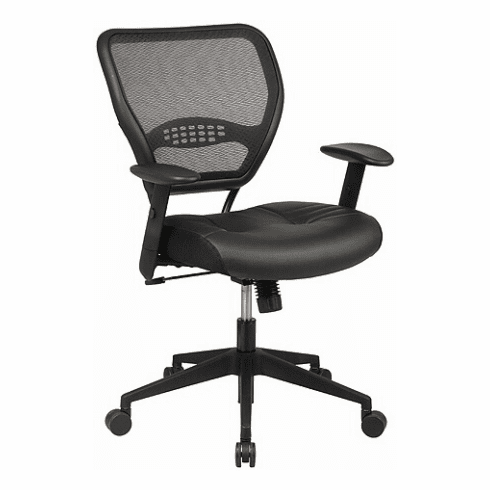 The chair comes with oversized carpet casters, a durable nylon base, and a limited Office Star lifetime warranty. This desk chair is designed to be in full compliance with ANSI/BIFMA standards. These mesh task chairs normally ship within 2-3 business days from our CA warehouse.